The first came in the form of a city proclamation in October of 2005 in which Bergin was commended for having contributed to the relief effort of the city of Kenner following Hurricane Katrina, the center of the very incident Bergin is investigating. Councilman-At-Large and Assemblyman-select Ruben Ramos Jr. said last week that he believed the director's involvement in the relief effort was limited to collecting items that were to be sent down in a truck to those who needed them, as many residents and members of the council did. Mason's second concern was that three of her fellow council members who voted on Bergin's appointment have close relatives in the police and fire departments, which Bergin has the task of overseeing. 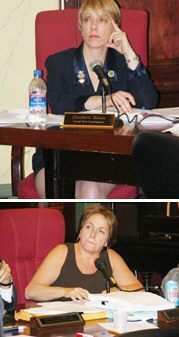 Although Mason did not mention the council members by name, during the heated council conversation that followed, it became apparent that Mason was referring specifically to Councilwoman-At-Large Terry LaBruno, who is married to a fire battalion chief and is the sister-in-law of Police Chief Carmen LaBruno; Councilman Michael Russo, whose two brothers are on the police force, and 1st Ward Councilwoman and Council President Theresa Castellano, who is married to a police officer. She is also Michael Russo's cousin. WHAT DO YOU MEAN BY THAT? Councilwoman Terry LaBruno confronts Councilwoman Elizabeth Mason on what she believes to be a resolution that casts doubt on the character of "born and raised" Hoboken residents. It exposed a long-running rift, or at least, attempts by politicians to capitalize on old suspicions (see sidebar). Russo was quick to object to Mason's notion. "To say that certain [council] members are not going to be able to vote because they have a brother or a husband who works for the city of Hoboken in my opinion is ridiculous," said the 3rd Ward councilman, who argued that if council members were prohibited from voting because of any connection they might have with the subject, they would not be permitted to vote on the budget or tax levy, since both would have a direct effect on their own finances. Russo added that Bergin would have little impact on the lives of their relatives, being that his purpose was not to oversee the day-to-day operations of the police and fire departments, but rather set policy much like the City Council. When asked last week if the vote was a conflict, Corporation Counsel Steven Kleinman, who is the attorney for the city, said in his opinion it was not. In an interview later in the week, Mason explained that when she originally voted for Bergin, she had only received the actual resolution minutes before the start of the meeting. She said she realized that she and the rest of the council were facing an "urgent situation." Mason stated that although she is not questioning Bergin's integrity as an individual, she feels that a more extensive selection process should have been conducted to find if there were better applicants for the position. Roberts appointed Bergin, a retired deputy fire chief, shortly after photos were displayed in TV newscasts showing members of the Hoboken SWAT team letting Hooters girls hold their guns on their way back from a humanitarian trip to Louisiana two years ago after Hurricane Katrina. The growing scandal was covered in the national media, and Roberts appointed Bergin quickly without conducting an open search. Mason also said last week that her fear was not that a conflict actually existed, but rather that a perception of a potential conflict existed, which could harm the outcome of the investigation. Bergin could not be reached for comment last week as to the extent of his involvement in the relief effort, though according to the mayor, Bergin himself did not make the trip down to Louisiana. Kleinman, who also believed Bergin's involvement in the effort was minimal, clarified the director's role in the current investigation, in an attempt to alleviate some of Mason's concerns. According to Kleinman, Bergin's purpose is more for gathering information for the investigation "in terms of the more general issues involving the SWAT team's existence and whether it should exist, [rather than having] to do with disciplinary or personnel matters." Bergin disbanded the SWAT team shortly after he was appointed. The actual investigation on the city level is being conducted by Labor Counsel David Corrigan, and on the county level, by Hudson County Prosecutor Edward DeFazio. The results from both investigations are expected to be completed by Jan. 15 of next year. With little or no notice being given to her fellow council members, Mason presented a resolution Monday in which she called for the U.S. Attorney to appoint a retired federal judge, who has not served within Hudson County, to conduct an independent investigation into the allegations recently put forth by five police officers in a lawsuit against the city of Hoboken. Those officers are accusing their superior, who also was the director of the SWAT team, of racist actions and comments. Mason's resolution led to a firestorm of criticism, which included accusations of her creating a situation that could harm the city's position in the lawsuit. Almost immediately after introducing the resolution, Kleinman, who has a history with Mason because he has represented both the city and school board in several cases brought by the councilwoman when she was a citizen, called her actions "completely out of order." Mason in return snapped back, "This is the public's right to have an independent [investigation] and have their voice heard." In a phone interview later in the week, the corporation counsel went on to say that Mason's proposal "had absolutely no basis in law for how matters of potential disciplinary actions are investigated. There are guidelines set forward by the attorney general of New Jersey, and we have to follow those as to how an investigation and disciplinary actions are handled with matters of the Police Department." Kleinman added, "Ms. Mason's resolution potentially could have interfered with our ongoing investigation and moreover, potentially could have threatened the city's ability to eventually prosecute disciplinary charges if warranted, and would have been harmful to the city's defense of the allegations in the lawsuit as well." In addition, other council members were equally upset as to Mason's decision to propose the resolution, which, according to several members of the council, had come before them during the previous meeting's closed session, but they apparently decided not go through with it at that time. "Because of the pending litigation [against] the city of Hoboken, no matter what our personal issue on this matter is, we have a fiduciary responsibility to the taxpayers of Hoboken to do what's in their best interest," said Councilman Ramos. "[That's] why this was done in closed session. To have this brought out into the public now, to undermine everything we've said behind closed doors, is just unfair to the council members." In a phone interview later in the week, Mason, who refused to comment on what was discussed during the closed session two weeks prior, defended her decision of going forward with the resolution, saying, "I believe that the perception of this investigation has to be truly independent. I believe the public and those involved need to feel comfortable that there is no conflict." Upon hearing this explanation, Kleinman said, "If Councilwoman Mason is really interested in this, there will be a time when an independent review of everything is appropriate." Kleinman added, "The U.S. Attorney's job is to investigate federal criminal activity. If they believed any suspicious activity occurred in Hoboken, certainly they will take the appropriate action and the city of Hoboken would cooperate." Mason said that part of her fear in waiting, as suggested by Kleinman and other members of the council, is that, "If a conflict of interest exists, whatever decisions are made [now] can be overturned. It would be a shame that if at some point it is determined that there is some perceived conflict or actual conflict and all this work is challenged." In response to a resolution that to some appeared to be mistrusting of Hoboken natives, Mayor David Roberts last week pointed out that Hoboken natives are entirely capable of doing proper investigations of their own. He used the example of the police arresting former Hoboken Mayor Steven Cappiello on a driving while intoxicated last week (see story on cover). "There were no favors done," Roberts said. "There was no special treatment. Here's a three-term mayor, who was a former police officer himself, being arrested by members of our Police Department. If that doesn't illustrate the integrity of our law enforcement officials, I don't know what will," said Roberts. The mayor added that Mason should give local authorities the time they deserve to conduct their investigation before she casts doubts. Roberts invited the councilwoman to request a further investigation after the results are in if she does not feel the investigation was properly conducted. Mason did have some support on the council. Zimmer said, later in the week, "I agree with the general concept that we should have an independent expert from outside Hoboken involved in the investigation. For the sake of our community, and for the police officers being questioned, we need to fully trust in the results of the investigation. The guilty should be punished and those officers cleared of wrongdoing should be fully cleared, and not questioned forever because the public may doubt the internal investigation." In the end, Mason's resolution failed in a 3-6 vote, with Mason, Zimmer, and 5th Ward Councilman Peter Cunningham supporting the measure. In reaction to Beth Mason's comment about the police investigation that "we need to move this [investigation] out of Hoboken," several council members took offense to what they perceived as a perceived lack of trust of those who hail from Hoboken. After Mason made her comment, Councilwoman-At-Large Terry LaBruno said, "I guess, Councilwoman Mason, some of us here have the misfortune of being born and raised in Hoboken... In closed session two weeks ago, we discussed this matter. And I said in closed session [that] I was so disgusted by your insinuation that the people of Hoboken can't do a [proper] interrogation [and] now our DNA has been questioned by many people in this audience." LaBruno's "DNA" reference came two weeks after a remark was made by community activist Helen Hirsch in which Hirsch said that such matters should be investigated by someone without "Hoboken DNA." The discourse highlights a longtime rift - or at least, frequent attempts by political players to capitalize on a perceived rift - between the old and new residents in Hoboken politics. The "us vs. them" idea goes back to the 1980s, during which time old-timers became suspicious of affluent newcomers who bought Hoboken condos and ran for office, telling natives what to do with their town. Although old-timers and newcomers have been able to work together in Hoboken politics, the old suspicions sometimes reveal themselves during arguments, or during political campaigns. One councilmember who is not from Hoboken originally, but who said he was offended by Mason's resolution, was Councilman-At-Large Peter Cammarano. "I find it is so reprehensible, so insulting that people from Hudson County or Hoboken are automatically excluded because of some perceived bias or lack of credibility," said Cammarano last week. "It's a clear slap in the face to people who have spent their entire lives in town and in this county." Cammarano added, "It begs the question, what else are those originally from Hoboken going to be automatically disqualified from in Beth Mason's Hoboken?" In response to Cammarano's charge, Mason said that she disagreed with his assessment of the resolution, saying that it was intended to address the issue of a perceived conflict of interest. She added, "it has nothing whatsoever to do with people from Hudson County or Hoboken." Mason went on to say that since moving to Hoboken, she has found those originally from Hoboken to be "very smart and very capable." The councilwoman added that if the city was willing to conduct a more extensive search for a public safety director, and out of all the applicants it turned out to be someone from Hoboken, she would be thrilled with the result.